Welcome to Neverland Ranch, where growing up is optional! Yesterday we spent the whole evening in surroundings of a bunch of talented performers and dinner servers, so original in their approaches. 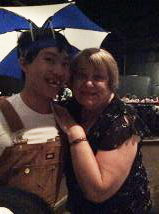 There is one photo of me with such a person in an umbrella hat. The Jubilation concept is unique in today’s theatre. 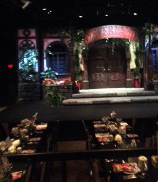 It combines a three-act musical comedy with a twist and four-course-dinner. The cast of characters were amusing us with table-side banter. Which was good to feel.